Ganesh Padmanabhan is the Head of Global Business Development and Worldwide Marketing at CognitiveScale. He is passionate about bringing disruptive technologies to market and has established a track record of driving growth through corporate strategy, product and business development as well as marketing and sales for startups and Fortune 500 companies. Before CognitiveScale, Ganesh spent more than a decade at Dell, later Dell EMC, where he held several leadership roles in corporate strategy, business development, sales, product management and marketing. Most recently, he served as Dell EMC’s General Manager of Worldwide Converged Solutions where he drove the 5x growth in a global business in 3 years. Prior to Dell EMC, Ganesh held several engineering leadership roles at Intel and Adaptec, in North America and Asia. Ganesh is a frequent keynote speaker, an evangelist for human machine partnership and an advocate for opportunity. He was recently honored by the Enterprise Management 360 as one of the the top 10 tech experts revolutionizing AI. 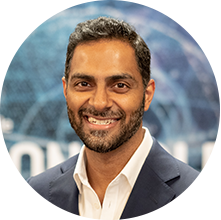 In addition to his role at CognitiveScale, Ganesh is an Entrepreneur in Residence at Capital Factory in Austin, as well as an advisor to several startups in Austin, Texas. He holds a Masters in Business Administration from McCombs School of Business at the University of Texas at Austin as well as a Bachelor degree in Mechanical Engineering from the University of Calicut in India.